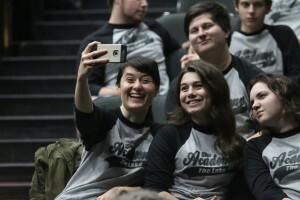 Gardner-Webb opened its doors to 12 high schools for the annual North Carolina Theatre Conference (NCTC) High School Play Festival on Nov. 6 and 7. High school theatre groups presented their 45 minute theatre productions, and two plays—“Love Sick” by Hopewell High School and “Fighting Demons” by Lake Norman High School—moved on to the Southeastern Theatre Conference (SETC). High school students take selfies while waiting on the next performance in Dover Theatre. The support was clearly heard and seen on both days of the event. The students’ cheers at the end of each play could be heard through the walls of the theatre in the commons. Students also purchased paper stars and wrote messages of encouragement on them for one another. The students participating had to follow several rules along with their directors. All productions were limited to 45 minutes and the cast and crew had to load props in and out of the stage area in less than 10 minutes. The props had to fit into 8×8 ft. outlines; anything outside the outlines could not be used. Actors had 45 minutes in the dressing rooms to get ready and must not have rehearsed on the host site on the day of the event. Shows that break these rules are disqualified. Gardner-Webb informed high school students about the university’s theatre department. 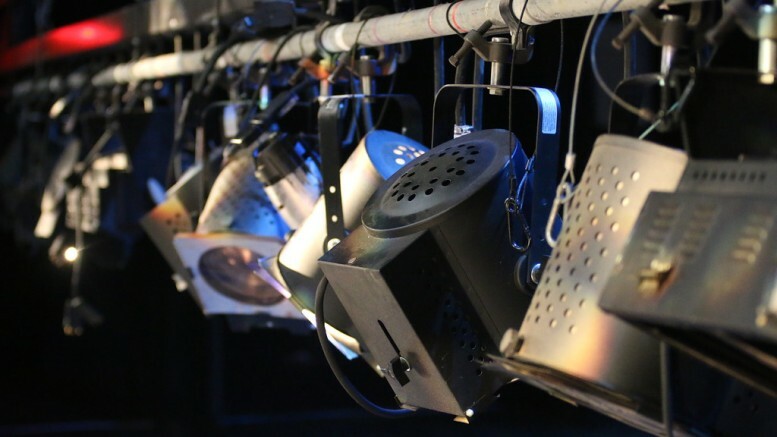 NCTC is the resource for theatre in the state, high school, professional and college level and aims to promote the theatre arts and encourage those who participate in it. 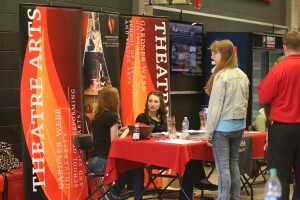 Be the first to comment on "GWU hosts high school play festival, promotes theatre arts"